Isaac Mizrahi Fall 2009 Collection. 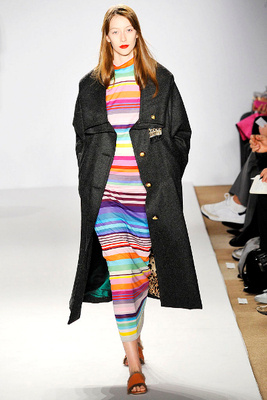 Isaac Mizrahi Fall 2009 collection is a very joyful, bright and full of colors. This funny but yet stylish collection has it all - glimmer, colors, and fur. Isaac Mizrahi titled his Fall 2009 RTW show "Smile", as a sign of a very optimistic vision the designer has on fashion, life and contemporary times. The designer, who got his start in fashion working as a design assistant at Perry Ellis in 1981 and then at Calvin Klein in 1982, is now a reputed name in the fashion industry. He is now known for his glamorous, feminine, and flattering designs and every season, fashion critics can't wait to see the new Isaac Mizrahi collections. 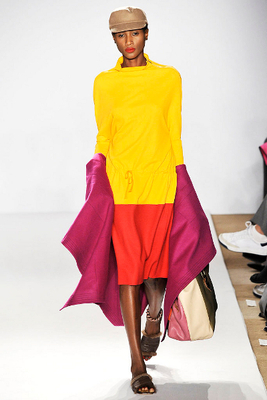 Isaac Mizrahi's Fall 2009 collection is a very joyful one, bright and full of colors. Models presented latest Mizrahi creations - silk dresses, crisp blouses, some beautiful high-waisted, extremely wide-leg trousers, plaid sweaters, and boatneck peacoats, all his designs being very well received by fashion critics. 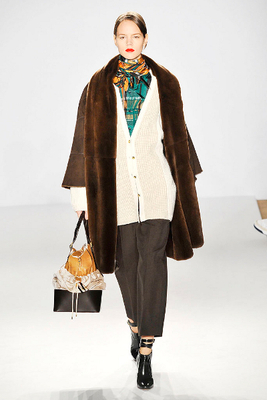 His big blankety comfort coats, his handbag hats, and the fur-trimmed slippers were just a basic Isaac Mizrahi creation. "I wanted to show actual luxury," he said post-show. "And luxury for me means fur, color, and glitter. Glitter is actually comforting to me."